"You've got another thing coming...but not for long!" Even Metal Gods have to hang it up eventually, and for Judas Priest, 2011 seems as good a time as any. The legendary heavy metal band has announced that next summer's Epitaph world tour will be their last. In a press release, the band stated that "the mighty Priest will certainly be going out strong as they rock the planet. 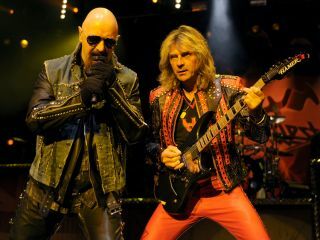 Hitting all the major cities throughout the world, they will be playing the songs that helped make the name Judas Priest synonymous with heavy metal! With all guns blazing and amps cranked to eleven, the band will be giving all their fans one last chance to witness the ultimate metal experience that is Judas Priest!" Starting 9 June, Priest are scheduled to play eight festivals in Europe, including a headlining spot for London's prestigious High Voltage Festival on 23 July. Below are all the tour dates that have been announced so far. Additional dates are said to be forthcoming.